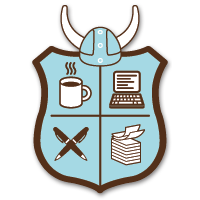 NaNoWriMo Special: 11,052 Words and Counting. As promised, here’s a NaNoWriMo tidbit. I approached the starting days with ambition and drive. I resisted the urge to hit the ground running at midnight and got a nice nights sleep instead. I woke up fresh and threw down some words on in the AM. Now it’s a slow and steady game to completion. I estimate I’ll do at least 2,000 words a day and do the occasional 5,000 word rush like Day one. Feel free to check my NaNoWriMo Page for specific details and check right here for snippets of my hard work. Chapter 1 — The Interview. “I always wanted to be interviewed on channel five, but I never imagined I’d be wearing tights.” Raymond Teller adjusted his gloves as he walked, ducking to avoid the low ceiling of the TV Studio hall. “Yeah.” Ray took a deep breath, pausing before the door. The word LIVE blinked on to the sign over the door, inches from his face. “No. I guess not.” Ray pushed open the door and stepped onto the stage. The studio lights caught the lenses of his domino mask, filtering in real time, and a digital read out of sixty percent appeared in his heads up display. They really think of everything. The audience erupted into cheers, clapping and whoops filled the studio. Ray raised a hand, thankful the studio ceiling had been much higher. He hadn’t gotten used to the extra height yet. A green frame formed in his vision. The identification systems sprung to life, confirming the woman he approached as Julie Tattle. He didn’t need a machine to recognize her brunette hair pulled into a bun and her powder blue dress-suit. Not that Ray could get on anyone about fashion. He had stepped onto a local television broadcast wearing dark blue tights, and a myriad of green gloves, boots, a chest plates and his underwear on the outside of his pants: all a dark green. Russ sported a more practical black and red motif with decided pride. Russ insisted the ridiculous getups were a staple for any respectable super hero. A hero had to be recognized at a glance, separating them from uniformed police officers. A leader must stand out most of all. His long standing friend and advisor willing accepted his role as his sidekick, Micron. Russ strode next to Ray, aiming a sideways glare through his black mask hood. Oh right. Ray stopped, hands on his hips and straightened to his full height, nine feet in all. Russ had always been shorter to him, but his five foot something frame looked tiny next to him. But so did a lot of people, standing next to Macro Man. Camera flashes filled the studio and Ray flashed his brightest smile. That part came natural. He had posed for enough pictures for small time magazines and business journals to keep it from fazing him. The cheers erupted, leaving Ray with a knot of nervousness in his stomach. He took the cue and approached the interview chairs. On the third step, the floor shifted under his boot. He caught the misstep, turning towards the far wall of the studio. A framed exclamation point flashed red warning in his HUD. A blast of light poured into the studio, slamming into the stylized double M motif on his chest plate. He toppled backwards, hit with the force of a speeding car and slid along the studio floor. He crashed into the interview chairs, slamming against the far wall, and Julie Tattle fled for her life. The cheers turned to screams of terror. Russ dodged the second blast and ran to toss open an exit door, then another. Micron’s super speed had been put to use for evacuation of the civilians, while Macro Man would take care of the heavy lifting. Ray stood from the rubble, pushing it aside like snow from a mound, and a red square settled amongst the smoke. Unidentified. No vitals. It’s a machine. Ray clapped a fist into his palm. “No need to hold back then.” He charged forward to a sprint into the rolling dust and debris. The HUD warning flashed again and a quick lateral step dodged the next laser shot. The second shot pushed away the remaining smoke revealing his foe, a walking machine. Ray tensed, hesitating long enough to take a heavy punch to the chest. It did little, urging him backwards a few inches, but the attacker had been humanoid. Ray clutched their arm, letting out a roar, and twisted their attack into an arm bar. Dust forced away from a released mechanism, like a hydraulic pump and twisted to make the act useless. It raised its pistol, readied, and fired. The warning flashed as the beam of energy slammed into his shoulder. Braced as he was, and with a good grip on the arm, they both slid backwards. His shoulder throbbed alongside his chest. The lasers tested the limits of his invulnerability. So I’m just really sturdy huh? “I’m taking this outside.” Ray lowered into a crouch and leapt, taking the killer machine with him. He smashed through the studio ceiling and into the blue New Orleans sky. Bits of concrete fell like rain, clattering against the news center’s roof. For the first time, he caught the machine off guard, it fired an impulse shot into the sky. He twisted, around wrenching it into a wild swing just as his boots crashed into the roof, next his improvised skylight. The robot struggled against his grip in futility, no amount of twisting or squirming could get Ray to relinquish his grip. His spinning hammer throw inched towards the roof’s edge and the machine lined up another shot of its weapon. It fired, deflecting off of his shoulder plate, and did nothing to stop his momentum. Inches from the edge, Ray lowered his arms, changing the spin’s trajectory and wrenched them from the four story roof. Ray tumbled through the air yanking the machine close in a belly to belly suplex towards the parking lot below. They crashed into a car crumpling the roof into a twisted ruin. The machine took the brunt of the impact, leaving Ray to safely stand. He dusted off flecks of paint and rubble from his uniform, staring down at the pinned machine. The audience poured out of the building, funneling around his point of impact. Julie Tattle came out of the building, followed close by Russ and a camera man. The recording light popped on. The car shifted under his feet and a voice filled his thoughts, one not his own. Get away. I can’t stop it. Ray hopped off the car, raising his fists. The warning hadn’t been from his HUD, no incoming signals, or increasing power signatures. The car erupted into an explosion, and the machine wrenched free. Flames from thrusters pushed the machine away, putting distance between the heroes and their assailant. The scanners of his mask warned of an increasing power signature. “That’s not good,” Russ said, tapping his temple. The warnings flew by too fast to read, but the machine punched a code of some sort into a panel at its arm. Ray noticed then, for the first time, the machine had a female humanoid form. It stood at average height of a woman but had the tell-tale uniform coloring of steel. Ray lowered his weight, getting ready to charge. The cars in the parking lot shook, and inched towards their foe. The killer machine tossed a small metal orb, crackling with energy. Ray’s mask picked it up as a threat. A chorus of beeps filled his ears, a sea of red blips filled his vision. “No. We–” Julie let out a yelp as the camera wrenched from her cameraman’s hands. Her belt snapped away from her spiraling towards the small hovering orb. Bits of metal from Ms. Tattle’s car sailed through the air, fallen screws, coins anything the field could grab hold of, slammed together in one point of space. The cars of the lot inched closer, until one upended and swirled about taken in by an invisible cyclone. Ray and Russ watched in silence. Car after car slammed into a gathering mass. Their mechanical assailant vanished from sight behind the twisted clump of steel, glass and plastic. “I think now would be a good time to run.” Ms. Tattle doubled back into the building, her cameraman close on her heels. “How big of a giant would we need to stop a mass of three dozen cars?” Ray said, cracking his knuckles. Ray nodded, focusing his mind. Fifty feet then, just to be safe. He crouched, letting power rush into him, and the world around him grew smaller. It had been simple illusion of course, the exact opposite happened. He got bigger. The ball of steel hurdled towards him, tossed into a wild roll across the lot. Concrete tore as the ball of jagged steel grew closer. Ray squared off his shoulder, waiting with palms up. The ball made impact and with a grunt he grabbed hold. The blades of jagged steel pricked through his gloves like needles, but didn’t pierce through. He slid back, his cape slammed into the news building, setting it to sway. The back of his head slammed into the roof, providing the leverage he needed. Ray hefted the steel ball straight up sending it screaming into the sky. “Micron. Track it.” Ray said, wiping his chin. The machine responsible for the attack, fled. Ray focused again, letting the power flee from his body, the world returned to normal around him. Stone rolled from the front of the news building; the impact had done quite a number on it. He stumbled forward, wincing.